I really enjoyed Murray Bail’s last book, The Pages, which was shortlisted for the Miles Franklin Award in 2008 (see my review) so I was looking forward to this one too. However, it would be a mistake to approach this book as a conventional novel about the disappointments of a middle-aged man. When I posted a Sensational Snippet from The Voyage last week I commented on how the rhythm of at least one sentence seemed like a waltz, and others in the long, discursive paragraphs are like the rhythm of waves lapping against the sides of the ship, or rolling across the vast ocean. Since the advent of economy airfares in the jet age, there are now not many of us who have travelled the world by ship to recognise that constant rolling motion lasting for weeks not days, a rhythm which takes over the body and makes it hard to adjust when back on dry land. This is the rhythm of this book, constant waves of thought and feeling until the last uncompromising jolt at the end. But that’s not all. The book is demanding because shifts in time and place occur, backwards and forwards, in Vienna and Australia and on the ship, all within the same paragraph, among paragraphs that fill four, five and more pages without a break. Later, when Elisabeth asked what they were talking about back there, Delage shook his head. For some time he had been trying to see the world a step removed from musical terms, in thoughts and conversations he had caught himself bringing everything back to the Delage piano, or the scarcity of skilled labour, or the music business in general, mentioning the advantages of his piano at every opportunity. This explains why the long paragraphs rock about in the past and the present, so that adjacent sentences drift into Frank’s disappointments in Vienna, the insistent voice of his bossy sister and his adventures with Elisabeth and her mother. The reader is inside the mind of a man who has been obsessed by his piano for so long that his default mode of thinking is about the piano. In his present, he is on a choppy voyage towards reconciling himself to failure, his hopes and ambitions borne away by the tide of an indifferent Europe. All he can think about is his piano and his efforts to persuade others to appreciate his life’s work. This is on his mind all the time – all the time – and when it’s occasionally swamped by the demands of reality into the present, it soon resurfaces to take over again. And Bail’s cunning prose works in the same way. In Bail’s novel Vienna is utterly indifferent to innovation in musical instruments and hostile to contemporary music, but he also pokes fun at Hildebrand, the avant-garde composer who doesn’t use the artifice of musical instruments but ‘natural sounds’ to which he ‘adds’ silence. (But Hildebrand has the last laugh, about which I shall say nothing except that it caused a sharp intake of breath when I read it). The music critic doesn’t like piano and deliciously, doesn’t have a name. In The Voyage it is the Schalla women who are interested in new ideas, decorating their rooms in clean sharp modern styles while Schalla the businessman plasters his walls with 19th century erotica. But is it just coincidence that their name sounds like the English word ‘shallow’ pronounced with Australian vowels? For more erudite reviews than mine, see Peter Craven at the SMH and Stella Clarke at The Australian. Avoid Andrew Reimer’s one at The Age unless you don’t care about spoilers. Lisa, I see you got to ‘The Voyage’ almost a year and a half before I did. 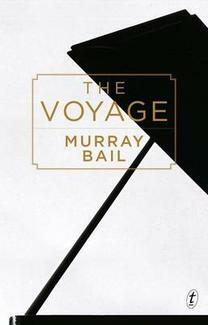 Of course Murray Bail is Australian, so you were in a good position. It was just released apparently worldwide last month. I found it absolutely amazing; it puts a smile on your face and keeps it there. My review will appear on Sunday. That’s wonderful, Tony, I am so glad it is receiving attention internationally. I can’t wait to see your review!